A new, lighter way to request a ride. Uber’s mission is to bring you a reliable ride, no matter who you are, or where you are in the world. Doing this means looking outwards to the world, and also inwards, to our own practices to see how we can best meet people’s needs, everywhere. Which is why we are introducing Uber Lite. Designed and developed in India and purely for Android, Uber Lite is a version of the Uber app designed to work on devices with limited data, storage, speed, network and battery. Whether you’re a regular user of Uber who might be looking for a way of requesting rides when roaming in a foreign country, or are a new Uber user with a limited data plan, Uber Lite gives you new possibilities for movement. Far from being purely an alternative to Uber, Lite can be seen as a useful addition to the main app. Uber Lite is designed to work on any Android device from 4.1 Jellybean and above. It has an average response time of 300ms which reduces the chance of lagging or crashing, meaning that most healthy devices built after 2012 will run Uber Lite comfortably. Does it work with my main app? Yes – you can use Uber Lite and Uber with just one account. You can request an Uber using either app, even switching from one app to the other between the start and end of your journey. This could help people who want to request an Uber using the Uber app when in wifi range, and then switch to the Uber Lite app for the journey to conserve data or battery life. What is Uber Lite’s size? Uber Lite downloads in under 5MB, or the space of three selfies. Once on your disk it uses just 25MB. Its lightness also puts less of a strain on your device’s processing power – which in turn uses less battery. What are the key differences in the apps? Uber Lite takes a stripped-back, functional design approach, keeping it light in size but not in features. Key information is provided in text, including the type of vehicle, the lowest fare estimation, and network condition. Uber Lite takes a ‘tap over type’ approach – making it easy to find your destination and with only a few letters typed in. As a consequence of this lean approach, Uber Lite manages to use a lot less of your data, storage, battery and processing power. While Uber Lite is designed to work in low connectivity areas below 3G, you cannot request a ride with no connectivity. 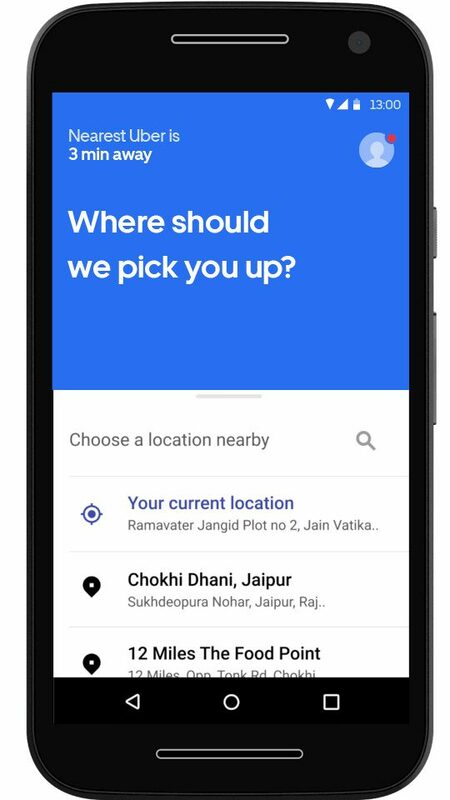 You can set your pickup destination to a local landmark, however – meaning that you can request a ride in low connectivity and then find it in no connectivity, by meeting your driver at the designated landmark. While maps do not come as standard on the Uber Lite app, they can be toggled on from within the app. Does Uber Lite cost the same? Yes – Uber Lite is still Uber – just running off a new, lighter app version. It’s free to download from the app store, and lets you access the same Uber rides as are available in your market through either app. Where can I download Uber Lite? Uber Lite is available to download on the Google Play Store. Find it here.